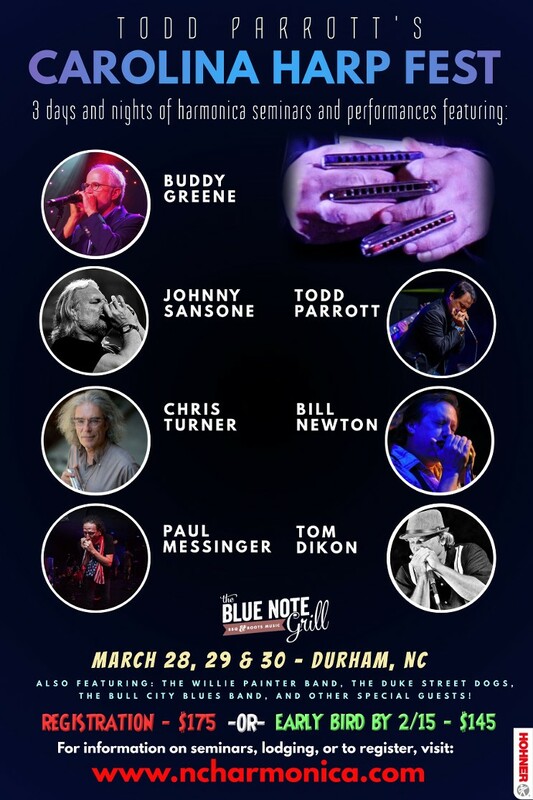 The 2019 Carolina Harp Fest will be held March 28, 29 & 30, featuring, Buddy Greene, Johnny Sansone,Todd Parrott, Paul Messinger, Chris Turner, Jerry Fierro, Tom Dikon and Bill Newton, at the Blue Note Grill in Durham, NC. Don't miss it! THE 2019 CAROLINA HARP FEST is coming! Join us at the Blue Note Grill in Durham, NC for 3 days and nights of harmonica seminars and performances.